You may think the hardest, most important parts of self-publishing your book are the writing and the actual process of creating a book. But you would only be half right—the part of self-publishing that is vital to the success of your book is still ahead: self-promotion. Because publishing companies are devoting less of their time, energy, and money to promoting a book, most of the marketing work falls to the author. But a vast majority of authors don’t have any prior marketing experience; often, they don’t know where—or how—to get started. 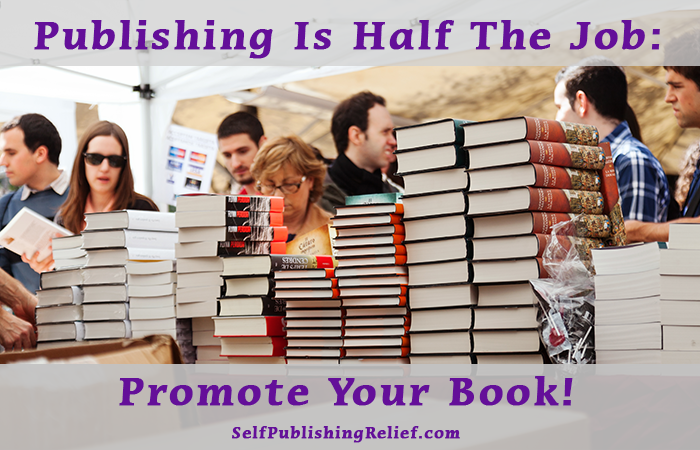 Get an author website, a blog, social media, the works—and cross-promote. Many authors feel allergic to social media, but few things are more crucial for promoting self-published books. In this digital age, social media sites like Facebook, Twitter, and Pinterest aren’t optional for authors—they’re necessities! If the idea of maintaining multiple accounts seems overwhelming, our Virtual Assistant program can do all the work for you. Raise interest in your book by hosting digital contests and giveaways. Getting readers to come to you can seem impossible—but often, all you need to do is offer an incentive. Hosting a contest or giveaway on your author website will build up the hype about your book. Once you set the contest guidelines (the simpler and more creative, the better) and the deadline, promote your event as frequently as possible to entice more participants to join in. And once the contest is over, interview the winner to gain additional promotional mileage! Get book reviews. This step leaves many self-published authors cowering in fear. But if you want to successfully promote your book and get some book sales, you’ll need to knock on the doors of a few reviewers. The worst that can happen? They’ll say no. But guess what? They may also say yes! There are numerous book bloggers who will be happy to read and review your book. You can also reach out to Amazon’s preferred customers and ask them for reviews. For faster results, consider the paid review services available: Kirkus, San Francisco Book Review, and Publisher’s Weekly’s PW Select…just to name a few. Make your book available through as many retail venues as possible—both online and brick-and-mortar. Most self-published authors default to the Amazon store, which is great because it’s well-known and comes with many benefits. But make sure your book is also available through other online retailers such as Google Books, iBooks, and the Nook Store. Then visit brick-and-mortar bookstores in person to ask that they carry your book, especially independently owned bookstores that may be interested in promoting local authors. Ensure your book is well designed. This is imperative for your book cover: Choose a cover design that’s eye-catching and professionally designed to complement the mood and content of your book. For the inner pages, format to industry standards and select fonts that are legible and look good in both digital and print versions. You don’t want bad word-of-mouth about sloppy formatting and illegible type to ruin your book’s reputation and sabotage your sales efforts. Although promoting your self-published book can seem like a lot of work—and sometimes it will be—it’s not unmanageable. Follow these six marketing steps and you’ll soon be ringing up book sales! QUESTION: What strategies for marketing self-published books have brought you the most success? 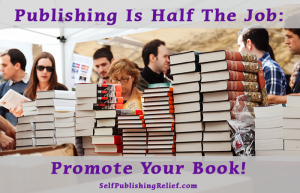 ← Know Your Goals Before You Self-Publish! Very useful hint regarding how to promote self-published books, in addition the author would do everything possible in his power. Other than public media, one can strive hard in making strong contact through friends, family members, and churches that as well would help in promoting the new and unique books, such as collection of poems, because very exciting to read it. Great article. Do you offer a promotion service? The article os good as it gives a Heads up about marketing for self published books. It is really a part of the matter not deemed to be put aside. I have recently written two books and am ready to publish and promote them. Thanks for the tips. I have been waiting 40 years to do this, so I am especially eager to see the end products. This would be a book of poetry, containing about 60 poems mostly between 15 & 30 lines each. Could you give me a rough idea of the cost to me if you undertook to publish this ? For 2,3,4 or 5 hundred copies ? Some excellent pointers there for the folks who are starting out. As far as ebooks go especially for the self-pub ones you can also attend book conferences and promote yourself there too though it is a little difficult when your work is digital. BILL BRYANT … you start each day and you end each day …same goes for writing. It sounds like you are failing in the plotting stage where if you have everything plotted out as a framework you should be able to move on and complete your work. My only problem in finishing a book is a punchy sentence to end on. You offer up some great ideas…and I have tried them all over this past summer. Writing is definitely the easy part. If people knew how exhausting it was to market and promote your own book, it might really discourage them. However, I will continue to work on this less-exciting endeavor…and, I will continue to write my novels. Joanne, Unfortunately we are not a promotional service. Peter, Unfortunately we do not work with poetry books.